1)Before knowing the effect of Jupiter in 7th house first we have to know about Jupiter and 7th house. 2)Jupiter in 7th house is consider good regarding lagna and life span Matter. Only a minor effect on kaam matter. It may cause for is a little problem regarding 7th House is Kama matters. 3)Jupiter in 7th house aspects lagna so as a natural beneficial planet, its aspects on lagna give strength to lagan. That’s why Jupiter in 7th house good for lagan. A famous astrologer told Jupiter aspects is just like Ganga Water(in the sense of Purity). So Jupiter aspects save lagan from all problem ( but always remember it’s just a basic other factors also give impact on the results regarding Jupiter such as house lordship and placement of Jupiter in a particular sign and nakshatra and aspects and yuti with Jupiter ). 4)7th house is a marak house and placement of Jupiter in 7th house save native from evil effect of 7th house and may be give good lifespan to the native. If Jupiter is afflicted then native may be suffering from kapha dosha, abdomen problem, liver problem, etc depend on placement of Jupiter. 5)7th house is dara house so its belongs to native’s wife. When Jupiter occupy 7th house native’s wife may be beautiful, decent, faithful, religious, and having good morality. 6)7th house Jupiter also aspects lagna means having impact on native’s body physique. So native may be fair, handsome, charming. Native may be kind hearted and liberal. 7)Jupiter in 7th house aspects 3rd house of communication so native may be sweet and pleasant in communication. Native may be eloquent (very good) speaker. So native may be good poets, writers etc. 8)7th house is bhavat bhavam for 4th house (education) and Jupiter is Vidya karak so its placement in 7th house, native may has good learning ability and knowledge and good education. 9)7th house is bhavat bhavam for 10th house. So when Jupiter occupy 7th house and its aspects on 11th house (profit house) then native may be got profit through Kingship or king (in modern day government or authority ). Means Native may be in good post in government office or in any MNC or in any authority. Other indication is native may be more superior position from his father or more liberal from his Father or more Name and fame from his father. 10)7th house Jupiter is also indicating native may be good diplomat (7th belongs to politics, give blessing of government and good speaker and good communicating ability specially regarding counseling matter because Jupiter belongs to sama niti). 11)7th house also belongs to Travel house specially foreign place or place which is very far away. So 7th house Jupiter is indicating native may go for religious place which is very Far away from native’s town (Jupiter belongs to religious place). 12) Jupiter is Putra Karak planet and 7th house belongs to satputra(good child) so native may has good childs. It is also indication of happy marriage life and happiness in marriage life. As Jupiter belongs to suitable union so native may has suitable wife means a good understanding between each other. 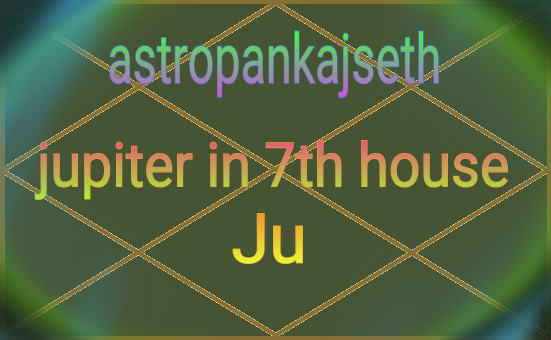 If Jupiter is afflicted in 7th house then it may cause problem (Marak effect of 7th House) for child. 13)Jupiter is karak planet for fortunes and wealth so when Jupiter occupy 7th house it maybe indicating native may get fortunes or wealth after marriage (because Jupiter in the house of wife). And for girl it maybe indication for she get a fortunate husband. 14)Jupiter is religious guru in royal court and its duty to teach religious matter to native so when it’s occupy in 7th house then he try to keep away to kaam matter to native and try to establish a good moral code of conduct regarding Kaam matter. But another thoughts is native has awesome happiness of sexual pleasure because jupiter is natural beneficial planet.